Andrew Jackson Donelson (August 25, 1799 – June 26, 1871) was an American diplomat. 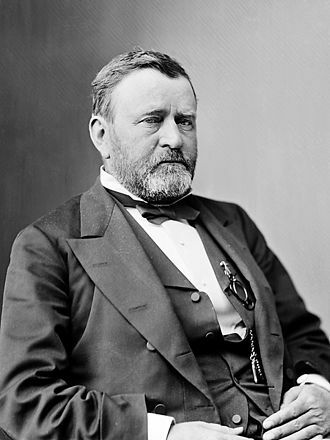 He served in various positions as a Democrat and was the Know Nothing nominee for Vice President of the United States in 1856. 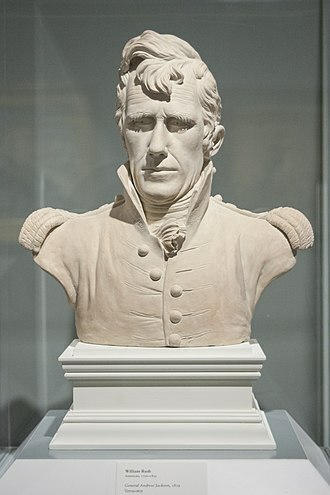 After the death of his father, Donelson was adopted by his aunt, Rachel Jackson, and her husband, Andrew Jackson. Donelson attended the United States Military Academy and served under his uncle in Florida. He resigned his commission and studied law, beginning his own practice in Nashville. He assisted Jackson's presidential campaigns and served as his private secretary after Jackson won the 1828 presidential election. 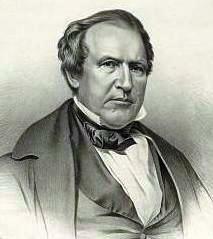 He returned to Tennessee after the end of Jackson's presidency in 1837 and remained active in local politics. After helping James K. Polk triumph at the 1844 Democratic National Convention, Donelson was appointed by President John Tyler to represent the United States in the Republic of Texas, where Donelson played an important role in the annexation of Texas. In 1846, President Polk appointed Donelson appointed as Minister to Prussia. He left that position in 1849 and became the editor of a Democratic newspaper, but alienated various factions in the party. In 1856, the Know Nothings chose him as their vice presidential nominee, and he campaigned on a ticket with former Whig President Millard Fillmore. The ticket finished in third place in both the electoral and popular vote behind the Democratic and Republican tickets. 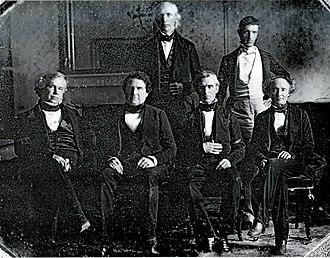 Donelson also participated in the 1860 Constitutional Union Convention. One of the three sons of Samuel and Mary Donelson, Andrew Jackson Donelson was born in Nashville, Tennessee. His younger brother, Daniel Smith Donelson, was the Confederate brigadier general after whom Fort Donelson was named. Donelson's father died when Donelson was about five. When his mother remarried, Donelson moved to The Hermitage, the home of his aunt, Rachel Donelson Jackson, and her husband, Donelson's namesake, future President of the United States Andrew Jackson. Rachel and Andrew Jackson adopted all three Donelson sons, including Andrew. Donelson attended Cumberland College in Nashville and then joined the United States Military Academy at West Point, New York, graduating second in his class in 1820. 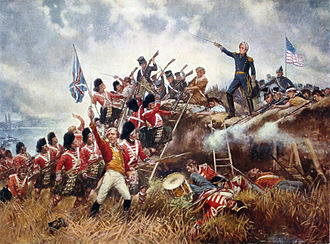 His two years as an officer in the United States Army were spent as aide-de-camp to Andrew Jackson, by then a major general, as Jackson campaigned against the Seminoles in Florida. With the campaign over, Donelson resigned his commission and studied law at Transylvania University in Lexington, Kentucky. A year later, he started practicing law in Nashville and, less than a year after that, had married his first cousin, Emily Tennessee Donelson. Donelson assisted his uncle during the 1824 and 1828 presidential campaigns and, in 1829, he became Jackson's private secretary when his uncle was inaugurated as President of the United States. His wife Emily served as White House hostess and unofficial First Lady of the United States due to Rachel Jackson's death in December, 1828. Donelson remained Jackson's private secretary throughout his administration. 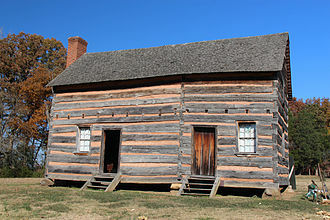 During his stay in Washington, Donelson had his new home, Poplar Grove (later renamed Tulip Grove), constructed on the land he had inherited from his father, which was adjacent to the Hermitage. In 1836, Tulip Grove was completed. Shortly afterward Emily died of tuberculosis, leaving four young children. 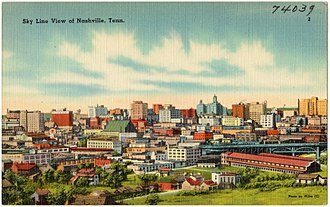 Donelson moved back to Nashville after Jackson's retirement the following year, where he helped Jackson sustain the Democratic party in a variety of ways for the next seven years. These services included writing newspaper editorials defending Democratic principles and helping Democratic candidates campaign for state, local, and national offices. In 1841, Donelson married another cousin, Elizabeth (Martin) Randolph, with whom he would have eight more children. Elizabeth Martin Randolph was a widow of Meriwether Lewis Randolph, a son of Martha Jefferson Randolph, and a grandson of Thomas Jefferson). In 1844, Donelson was instrumental in helping James K. Polk win the Democratic presidential nomination over Martin Van Buren and other more notable candidates. President John Tyler appointed Donelson Chargé d'Affaires of the United States mission to the Republic of Texas, probably hoping that Jackson's nephew would help persuade former Tennessee politician Sam Houston to endorse the United States' annexation of Texas. Donelson was successful in this endeavor, and Texas joined the United States on December 29, 1845. He was then made Minister to Prussia in 1846, a position he would hold until President Polk's Democratic administration was replaced by the Whig administration of Zachary Taylor in 1849. (Donelson's constant complaining about his personal finances and desire for a higher salary probably had more to do with the change than partisan differences.) Between September 1848 and November 1849, during the time of the Frankfurt Parliament, he was the U.S. envoy to the short-lived revolutionary government of Germany in Frankfurt. In 1851, Donelson became the editor of the Washington Union, a Democratic newspaper. 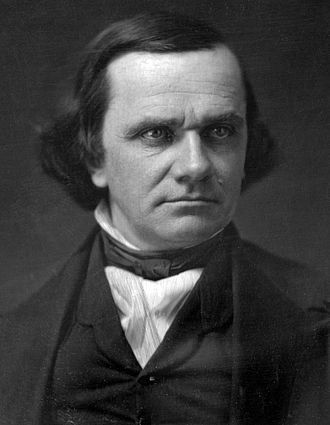 However, as sectionalism became the dominant issue of American politics, Donelson became unpopular with several factions within the Democratic party, who forced him out in 1852. 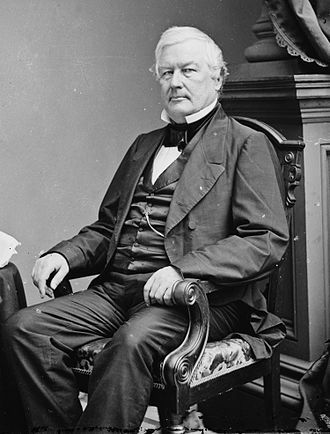 In 1856, Donelson was nominated as the running mate of former President Millard Fillmore on the American Party ticket. Fillmore and Donelson managed to garner over 20 per cent of the popular vote but only the eight electoral votes of Maryland. In 1858, Donelson sold Tulip Grove and moved to Memphis, Tennessee. 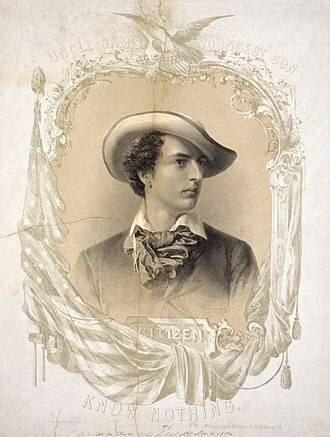 He participated primarily in local politics there, although he was a delegate to the Constitutional Union party's national nominating convention, which nominated his old Tennessee nemesis, John Bell, as its presidential candidate. 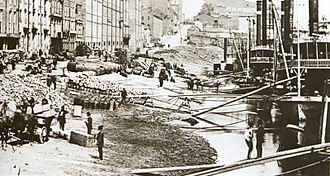 During the Civil War, Donelson was harassed by both sides of the conflict. He also lost two of his sons in the war. 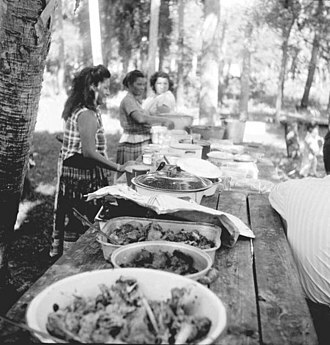 During Reconstruction, he split time between his Memphis home and his plantation in Bolivar County, Mississippi. In his correspondence with his wife, he groused about the need to pay wages to African American workers who had once been slaves. 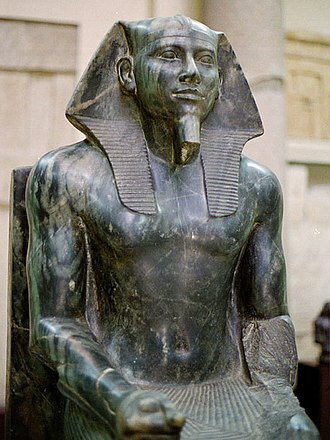 He died at the Peabody Hotel, Memphis, Tennessee and is buried in Elmwood Cemetery. Mark R. Cheathem, Old Hickory's Nephew: The Political and Private Struggles of Andrew Jackson Donelson (LSU Press, 2007). "Andrew Jackson Donelson's Home in Bolivar County, Mississippi". 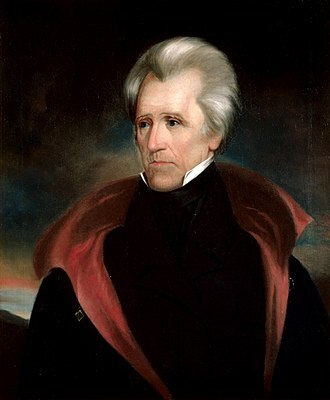 Jacksonian America: Society, Personality, and Politics blog. Retrieved October 2, 2012. "The History". Historic Rock Castle. Archived from the original on March 11, 2005. Retrieved February 20, 2006. Ellis, Hugo (2001-06-06). "Donelson, Andrew Jackson". Handbook of Texas Online. The Texas State Historical Association. Retrieved 2006-09-03. Wilson, J. G.; Fiske, J., eds. (1900). "Donelson, Andrew Jackson" . 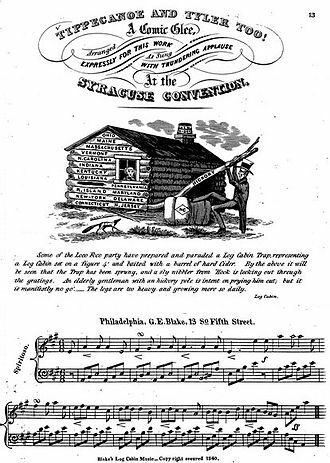 Appletons' Cyclopædia of American Biography. New York: D. Appleton. The Republic of Texas was an independent sovereign country in North America that existed from March 2,1836, to February 19,1846. The citizens of the republic were known as Texians, the Mexican province of Tejas declared its independence from Mexico during the Texas Revolution in 1836. The United States recognized the Republic of Texas in March 1837, the Republic-claimed borders were based upon the Treaties of Velasco between the newly created Texas Republic and Antonio López de Santa Anna of Mexico. The republics southern and western boundary with Mexico continued to be disputed throughout the republics existence, Texas claimed the Rio Grande as its southern boundary, while Mexico insisted that the Nueces River was the boundary. 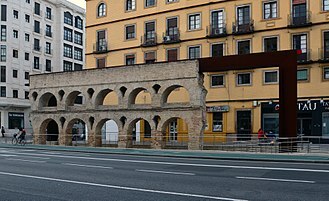 However, the United States again inherited the southern and western border dispute with Mexico, Texas had been one of the Provincias Internas of New Spain, a region known historiographically as Spanish Texas. Though claimed by Spain, it was not formally colonized by them until competing French interests at Fort St.
Louis encouraged Spain to establish permanent settlements in the area. 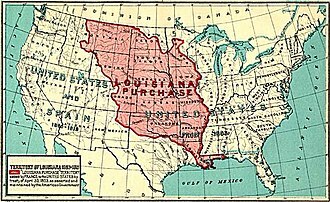 Sporadic missionary incursions occurred into the area during the period from the 1690s–1710s, in 1762, France ceded to Spain most of its claims to the interior of North America, including its claim to Texas, as well as the vast interior that became Spanish Louisiana. During the years 1799 to 1803, the height of the Napoleonic Empire, Spain returned Louisiana back to France, starting in 1810, the territories of New Spain north of the Isthmus of Panama sought independence in the Mexican War of Independence. Many Americans fought on the side of Mexico against Spain in filibustering expeditions, one of these, the Gutiérrez–Magee Expedition consisted of a group of about 130 Americans under the leadership of Bernardo Gutiérrez de Lara. Gutierrez de Lara initiated Mexicos secession from Spain with efforts contributed by Magee, bolstered by new recruits, and led Samuel Kemper, the expedition gained a series of victories against soldiers led by the Spanish governor, Manuel María de Salcedo. 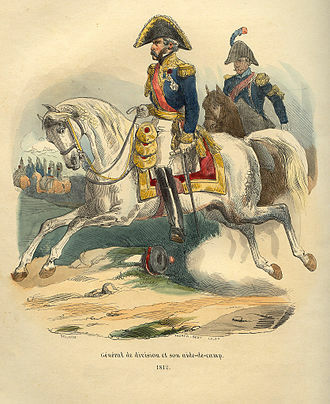 Their victory at the Battle of Rosillo Creek convinced Salcedo to surrender on April 1,1813, on April 6,1813, the victorious Republican Army of the North drafted a constitution and declared the independent Republic of Texas, with Gutiérrez as its president. 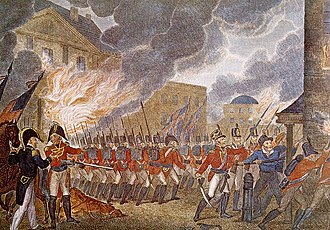 Soon disillusioned with the Mexican leadership, the Americans under Kemper returned to the United States, the ephemeral Republic of Texas came to an end following the August 18,1813 Battle of Medina, where the Spanish Army crushed the Republican Army of the North. 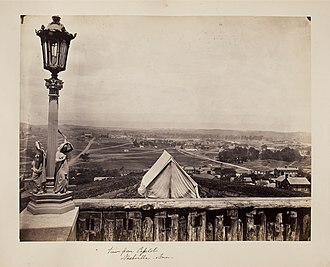 Since Mexican independence had been ratified by Spain shortly thereafter, Austin would travel to Mexico City to secure the support of the new country in his right to settle. 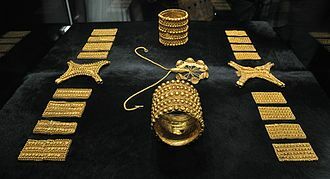 The establishment of Mexican Texas coincided with the Austin-led settlement, leading to animosity between Mexican authorities and ongoing American settlement of Texas, the First Mexican Empire was short lived, being replaced by a republican form of government in 1823. 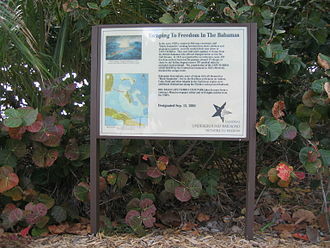 Following Austins lead, additional groups of settlers, known as Empresarios, in 1830, Mexican President Anastasio Bustamante outlawed American immigration to Texas, following several conflicts with the Empresarios over the status of slavery in the region. Daniel Smith Donelson was a Tennessee politician and soldier. He was the nephew of Americas seventh president, Andrew Jackson, Donelson was born in Sumner County, one of the three sons of Samuel and Mary Polly Smith Donelson. Donelsons father died when Donelson was about five, when his mother remarried, Donelson moved to The Hermitage, the home of his aunt, Rachel Donelson Jackson, and her husband, future President of the United States Andrew Jackson. Rachel and Andrew Jackson adopted Donelson and his two brothers and his older brother, Andrew Jackson Donelson, was the private secretary to Jackson during his presidency and a vice presidential candidate in his own right. S. In 1821, Donelson entered West Point, and graduated in 1825 and he resigned his commission only half a year later, on January 22,1826, to become a planter in Sumner County. He was a member of the militia in Tennessee, starting as a major in 1827. 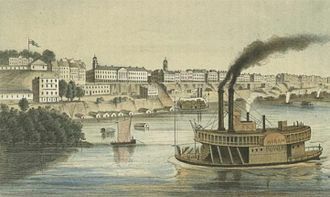 In 1834, Donelson resigned his commission in the Tennessee militia and moved to Florida and his stay there was brief, and he moved back to Tennessee two years later, still a planter. In 1841, Donelson became a member of the Tennessee House of Representatives and he left after one two-year term in 1841–1843, but returned 12 years later, in 1855, serving in 1855–1861 and this time rising to the office of Speaker for 1859-1861. 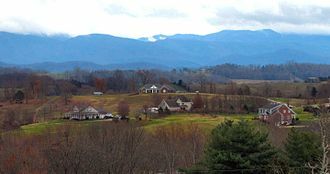 Donelson and his wife Margaret had 10 children born between 1834 and 1854, Sarah, Rebecca, Martha, Susan, John B. and they resided at Hazel Path in Hendersonville, Tennessee. He was returned to his previous rank of general in the militia and that May approved the locations of Fort Henry and Fort Donelson. After Tennessee joined the Confederacy, he became a general in the Confederate Army on July 9,1861. Donelson was promoted to general on March 5,1863, his confirmation by the Confederate Senate on April 22 happened prior to its knowledge of his death. 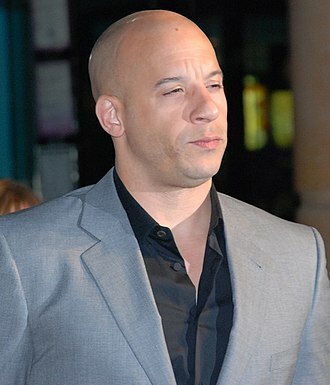 He died of chronic diarrhea at the water resort Montvale Springs, near Knoxville. He was buried in the Presbyterian Cemetery in Hendersonville, list of American Civil War generals Eicher, John H. and David J.
Zachary Taylor was the 12th President of the United States, serving from March 1849 until his death in July 1850. Before his presidency, Taylor was an officer in the United States Army. Taylors status as a hero as a result of his victories in the Mexican-American War won him election to the White House despite his vague political beliefs. His top priority as president was preserving the Union, but he died 16 months into his term, before making any progress on the status of slavery and he remains the only President to come from Louisiana. 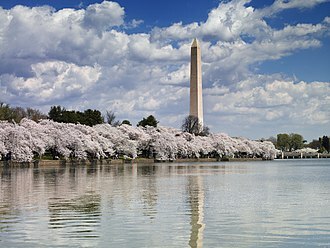 Taylor was born into a prominent family of planters who migrated westward from Virginia to Kentucky in his youth and he was commissioned as an officer in the U. S. Army in 1808 and made a name for himself as a captain in the War of 1812. 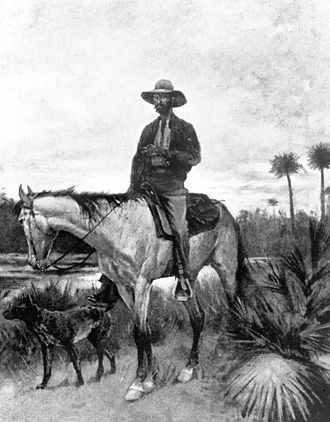 He climbed the ranks establishing military forts along the Mississippi River and his success in the Second Seminole War attracted national attention and earned him the nickname Old Rough and Ready. 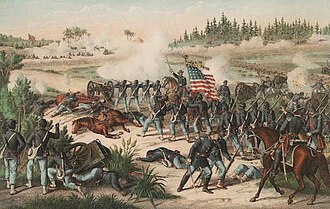 The Mexican–American War broke out in April 1846, in May, Taylor defeated Mexican troops commanded by General Mariano Arista at the Battles of Palo Alto and Resaca de la Palma, and managed to drive his troops out of Texas. Taylor subsequently led his troops into Mexico, where once again defeated Mexican troops commanded by Pedro de Ampudia at the Battle of Monterrey in September. Defying orders, Taylor moved his troops further south, despite being severely outnumbered, he dealt a crushing blow to Mexican forces under Antonio López de Santa Anna in February 1847 at the Battle of Buena Vista. After this, most of Taylors troops were transferred to the command of Major General Winfield Scott, the Whig Party convinced the reluctant Taylor to lead their ticket in the 1848 presidential election, despite his unclear political beliefs and lack of interest in politics. 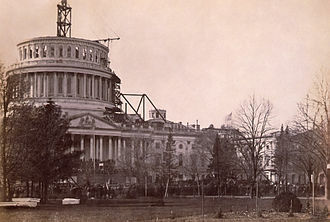 At the 1848 Whig National Convention, Taylor defeated Scott and former Senator Henry Clay to take the nomination, as president, Taylor kept his distance from Congress and his cabinet, even as partisan tensions threatened to divide the Union. Debate over the status of slavery in the Mexican Cession dominated the political agenda, despite being a Southerner and a slaveholder himself, Taylor did not push for the expansion of slavery, and he sought sectional harmony above all other concerns. 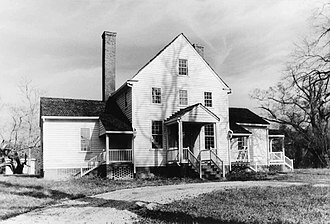 The Hermitage is a historical plantation and museum located in Davidson County, United States,10 miles east of downtown Nashville. 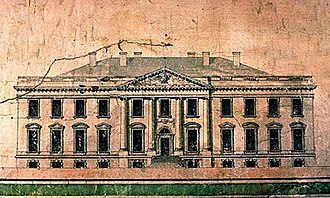 The plantation was owned by Andrew Jackson, the seventh President of the United States, Jackson only lived at the property occasionally until he retired from public life in 1837. Enslaved men and women, numbering nine at the purchase in 1804 and 110 at Jacksons death, worked at the Hermitage, principally involved in growing cotton. It is a National Historic Landmark, the Hermitage is built in a secluded meadow that was chosen as a house site by Rachel Jackson, wife of Andrew Jackson. It had four rooms on the floor and four rooms on the second level, each having a fireplace. The large central hallways opened in warm weather from front to back to form a breezeway, a simple portico was added later. In 1834, a fire seriously damaged the house, with the exception of the dining room wing. 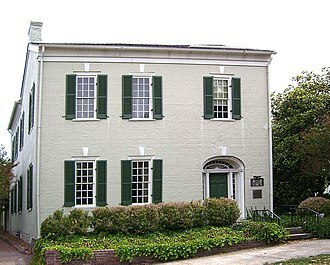 This prompted Jackson to have the current 13-room Greek Revival structure built on the foundation as the former house. The architects for the house were Joseph Reiff and William C, who were building Tulip Grove across the road. The mansion is built in a layout, approximately 104 feet from east to west and 54 feet from north to south. Within the portico is a balcony with simple square balusters. One-story wings, with single fenestrations, flank the mansion and extend beyond the mansion to the front of the portico, while the southern façade gives the appearance of a flat roof, the three other elevations reveal that the tin-covered roof is pitched. The front façade was painted a light tan and sand coating was added onto the columns, a near replica of the front portico is found on the north end of the house, though featuring Doric-style columns and capped with a pediment. The layout of the block of the house is four large rooms separated by a center hall. The entry hall with plank flooring painted dark is decorated with block-printed wallpaper by Joseph Dufour et Cie of Paris, at the far end of the hall is the elliptical cantilevered staircase, with mahogany handrail, that leads to the second level. An aide-de-camp is a personal assistant or secretary to a person of high rank, usually a senior military, police or government officer, a member of a royal family, or a head of state. This is not to be confused with an adjutant, who is the administrator of a military unit. The first aide-de-camp is typically the foremost personal aide, in some countries, the aide-de-camp is considered to be a title of honour, and participates at ceremonial functions. The badge of office for an aide-de-camp is usually the aiguillette, whether it is worn on the left or the right shoulder is dictated by protocol. 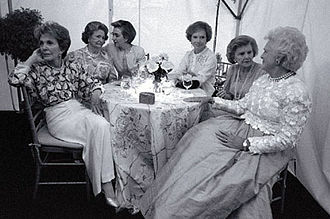 A controversy was raised in 2006, when president Néstor Kirchner decided to promote his army aide-de-camp, Lieutenant Colonel Graham to colonel, upon taking office, former president Cristina Kirchner decided to have, for the first time, female officers as her aides-de-camp. In each of the forces, the chief of staff and other senior officers have their own adjutants, normally of the rank of major or lieutenant colonel. 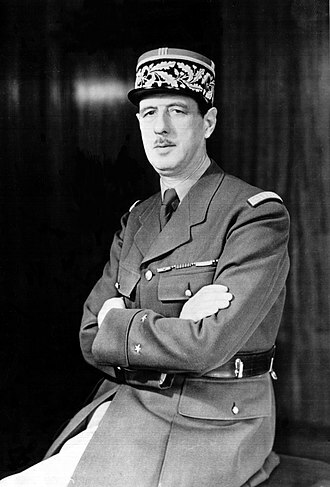 An aiguillette is worn on the shoulder by aides-de-camp and adjutants as a symbol of their position. In Belgium the title of Honorary Aide-de-camp to the King can be granted by the court for services rendered. 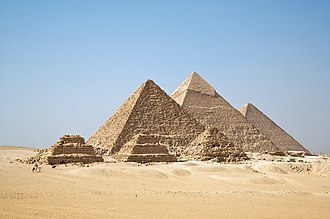 Notable people include Major General Baron Édouard Empain, Count Charles John dOultremont, generals being field marshals, have four, lieutenant generals two, major generals one”. 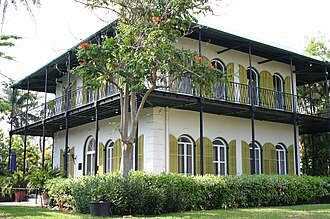 In British colonies and modern-day British overseas territories, the aide-de-camp is appointed to serve the governor, in 1973, the Governor of Bermuda, Sir Richard Sharples, and his aide-de-camp, Captain Hugh Sayers, were murdered on the grounds of Government House. On the last day of British rule in Hong Kong on 30 June 1997 and he gave the Vice Regal Salute before proceeding, with the Pattens, to leave Government House for the last time. Prince Charles is a personal aide-de-camp to Queen Elizabeth II, Honorary aides-de-camp to the Governor-General or state governors are entitled to the post-nominal ADC during their appointment. John Tyler was the tenth President of the United States. He was also, the tenth Vice President, elected to office on the 1840 Whig ticket with William Henry Harrison. Tyler became president after Harrisons death in April 1841, only a month after the start of the new administration. Still, the circumstances of his rise to the presidency. A firm believer in manifest destiny, President Tyler sought to strengthen and preserve the Union through territorial expansion, born to an eminent Virginia family, came to national prominence at a time of political upheaval. 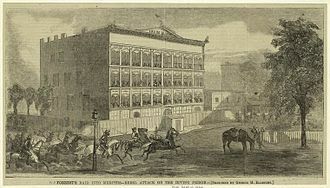 In the 1820s the nations only political party, the Democratic-Republicans, though initially a Democrat, his opposition to Andrew Jackson and Martin Van Buren led him to ally with the Whig Party. Tyler served as a Virginia state legislator, governor, U. S. representative and he was put on the ticket to attract states rights Southerners to what was a Whig coalition to defeat Van Burens re-election bid. 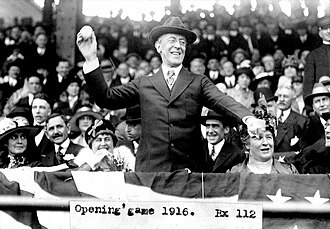 Harrisons death made Tyler the first vice president to succeed to the presidency without being elected to the office, because of the short duration of Harrisons one-month term, Tyler served longer than any president in U. S. history who was never elected to the office. 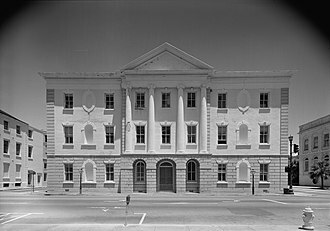 A strict constructionist, Tyler found much of the Whig platform unconstitutional, believing that the president should set policy instead of deferring to Congress, he attempted to bypass the Whig establishment, most notably Kentucky Senator Henry Clay. Most of Tylers Cabinet resigned soon into his term, and the Whigs, dubbing him His Accidency, though Tyler was not the first president to veto bills, he was the first to see his veto overridden by Congress. Although he faced a stalemate on domestic policy, he had several achievements, including the Webster–Ashburton Treaty with Britain. 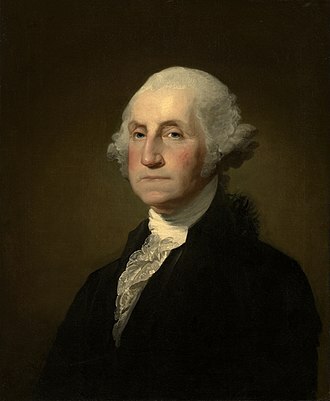 He initially sought election to a term as president, but after failing to gain the support of either Whigs or Democrats. 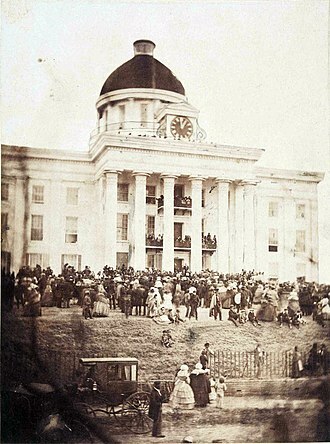 When the American Civil War began in 1861, Tyler sided with the Confederate government, although some have praised Tylers political resolve, his presidency is generally held in low esteem by historians. 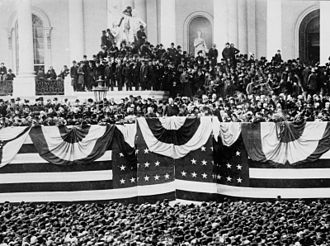 He is considered an obscure president, with presence in American cultural memory. 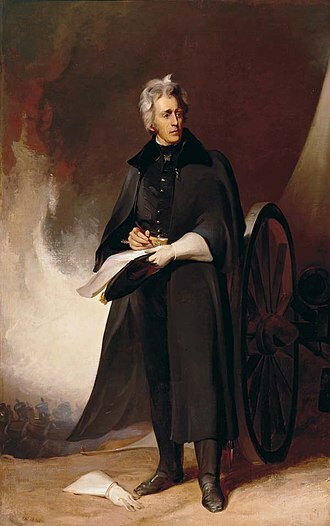 John Tyler was born on March 29,1790, like his future running mate William Henry Harrison, he hailed from Charles City County, both descended from aristocratic and politically entrenched families. A Constitutional Union campaign poster, 1860, portraying John Bell and Edward Everett, respectively the candidates for President and Vice President. 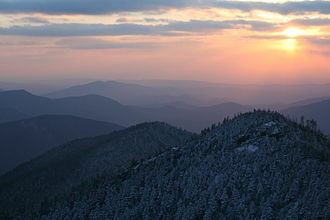 Once Lincoln was inaugurated, and called up the militia, Bell supported the secession of Tennessee. In 1863, Everett dedicated the new cemetery at Gettysburg. 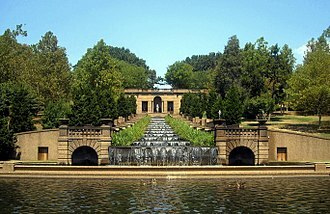 The tomb of Andrew and Rachel Jackson is located in the Hermitage garden. Hazel Path in Hendersonville, Tennessee.